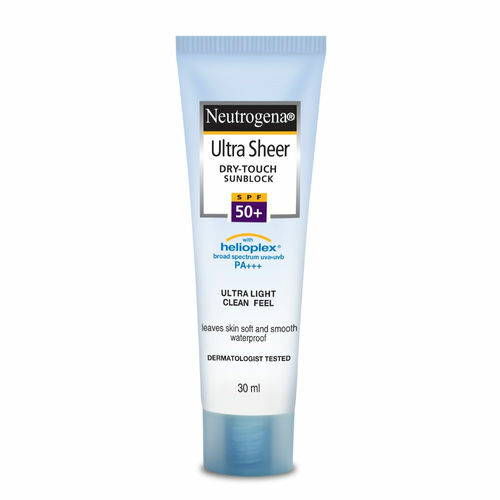 Get the best protection under sun with Neutrogena Ultra Sheer Dry Touch Sunblock. The cream provides broad spectrum protection from the harmful UVA and UVB rays of the sun. Say goodbye to skin darkening, sun burns and age spots with Neutrogena Ultra Sheer Dry Touch Sunblock. Infused with Neutrogena's exclusive Helioplex technology, it is perfect for all skin types. The Neutrogena sunscreen gets instantly absorbed into your skin leaving it'soft and smooth. The oil free formula is great and would not feel heavy on your skin. Explore the entire range of Face Moisturizer & Day Cream available on Nykaa. Shop more Neutrogena products here.You can browse through the complete world of Neutrogena Face Moisturizer & Day Cream .